Winning the lottery is what everyone dreams of, but for these lucky winners their dreams turned into nightmares. Turns out losing a fortune is much easier than winning one! Fortunately, help is at hand. At Millionaires Anonymous people are encouraged to discuss their stories and problems, and with the help of a twelve-step program the former millionaires are guided onto a path of enlightenment and self-fulfilment, learning along the way that money doesn’t buy happiness. Or does it? Having formed a secret syndicate, the group continue to gamble what little money they have left, pinning all their hopes on winning the jackpot again. The odds on that? Two-hundred and eighty-three billion to one. It’s a long shot, but it could happen, and if it did you’d better hope your syndicate is a group of mentally stable and well-rounded individuals… but more importantly, that you can find the bloody ticket! 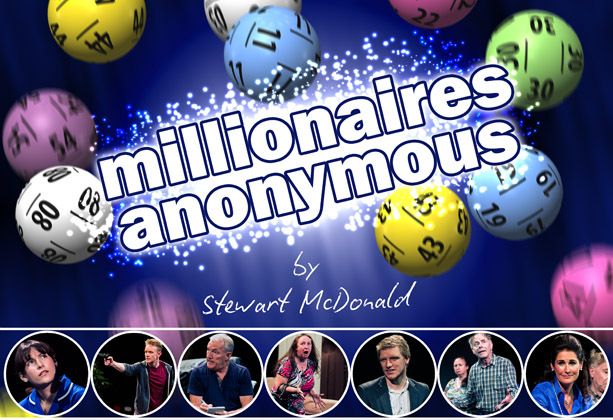 Millionaires Anonymous takes a hilarious look at our quest for happiness in all the wrong places. The play was originally performed at the Unity Theatre, Liverpool from 2nd – 4th of July 2015. In May/July 2016 it went on tour to The Brindley Theatre (Runcorn), The Atkinson Theatre (Southport), and the Salford Arts Theatre as part of the Greater Manchester Fringe Festival. Starring: Geraldine Moloney Judge, Neil MacDonald, Chrissi-Jo Hughes (2015), Annabel Entress (2016), Lee Burnitt, David Clayton, Albert Hastings, Caitlin Mary Carley Clough, Loaf.